One of the highlights of the TFA 20th anniversary summit was certainly when Secretary of Education Arne Duncan made a rousing speech at the closing ceremony. The most impressive part of his speech was when he described the transformation of Englewood High School in Chicago while he was heading that school district. He said that they shut it down because 60% of the students were not graduating. They replaced it with three charter schools. One of those charters, the all boys Urban Prep, just graduated their first class and 107 students graduated and got accepted to college. You can click the link below to see the whole speech, or watch the relevant 2 minutes by clicking on the lower link. Arne Duncan, U.S. Secretary of Education from TFA 20th Anniversary Summit on Vimeo. Pretty amazing and convincing that all we need is harder working teachers to overcome poverty and turn failing schools into wildly successful ones. Unfortunately, it’s a lie. This is what happens: Charters exaggerate (lie) about their stats then the stats get used to convince politicians and billionaires to change public policy. The fact that Duncan is using this story shows that this farce goes all the way to the top. Surely Obama believes this story. When I heard it, it sounded pretty far fetched. So I did a little bit of Diane Ravitch style investigative reporting to get to the truth behind that facade. According to this article, it was not the ‘same children’ attending Urban Prep as would have attended Englewood High School. They had the typical lottery which excludes certain families. It also had a mandatory three week program for students who got accepted, which eliminated even more students. And then, they did the typical ‘weeding out’ of kids who weren’t performing. Also, how could it be, literally, the ‘same children’ if Urban Prep is all-male while Englewood High was co-ed? Duncan seems to imply that the 107 students who graduated was a 100% graduation rate. Then this article points out that the 107 does not account for the fact that the original group was not 107 but, according to the Illinois Interactive Report Card, 166 students. Suddenly 107 out of 166 doesn’t sound quite as good. It’s about 64% which is a lot better than 40%, I know, but considering they had ‘creamed’ to begin with, I don’t know how good even that is. 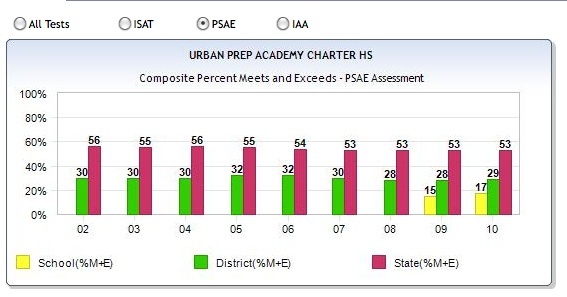 Here’s another good post about the Urban Prep myth. It’s scary that even the Secretary of Education would resort to this type of bending of the truth to advance an agenda that fails to meet the needs of the hardest to educate kids. If he was going to give just one example of a school that worked, couldn’t he have come up with even one that was a genuine success in the whole country? This entry was posted in book proposal, Debunking, favorites, Tom. Bookmark the permalink. Nice work. There are so many sweeping statements around Education Reform that it is nice to see your “story behind the story.” One thing I would I would like to see is 1) How many Urban Prep kids actually went to college (Arnie implies all 107 which is pretty amazing) compared to previous years. 2) How many of this first class will eventually graduate from college compared to previous years. I know college is not the only metric of success but with such low test scores it would be interesting to see if Urban Prep is actually preparing kids for college. Thank you, Gary, for posting this important information. We need accurate info when we respond to critics who throw these “facts” at us. It’s seems a bit strange that a TFA person is blogging about someone lying about educational data. There are a lot of people lying about educational data. If you read some of my other posts, I also report when TFA does the same. Just because I’m an alum from almost 20 years ago doesn’t mean that I’m someone who lies or that I support everything that TFA claims. If you are or ever were a TFAer then I think you should hang your head, and not talk too much (if at all)about anything in Education. Wendy Kopp has lead the way in the attack on public schools, teachers, and students. NCLB and Race to the Top woulda coulda never existed if it weren’t for Wendy Kopp/TFA lies and propaganda. TFA/Wendy Kopp seek to privatize education…..YES, they want to privatize education. They couldn’t come out and say it, so they spent 20 years tearing down the existing public structure and then suggesting a private structure to replace it. I agree that TFA has evolved into something that has the potential to be very destructive, and that worries me a lot. Keep in mind that when I was in TFA in 1991, the mission was just for us to teach in places that had such teacher shortages that if we didn’t do it, those students would have rotating groups of temporary substitutes. Then, as TFA people gained experience and started exaggerating their successes, things turned pretty ugly. I do not think, though, that this was part of some long-term plan that Wendy Kopp hand in mind back then. It morphed into that over years, and I’m doing what I can on this blog to help fight against that direction too. Thanks Again Gary. I created my own Teach for America program when I retired from a career in the high-tech industry. I had graduated from one of America’s highly selective universities and decided to give back as a Highly Qualified Teacher licensed in the Sciences (including Computer Science.) I was appalled to find that since the 60s, when the highly talented teachers were held in teaching, were allowed to leave that the field had been taken over by dim-wits with Education degrees–some of the stupidest people I have ever run across. These folks had dismally low SAT and ACTs, abysmal GRE scores (if their Ed school graduate program even required them) and were allowed to be in contact with young people. But now the Ed schools have figured out that they have a cash cow, taking the stupidest people they can get, giving them their phony Ed school degrees, and perpetuating a system which undermines education in the public schools. Thanks for keeping it real! As a fellow alum, I’m nearly sickened by TFA’s current attitudes towards teaching. To them, it’s not an art, it’s a science, and if all teachers would just do X, Y, and Z then lo, and behold, achievement gap closed! I taught last year in a mostly TFA charter school in San Jose. Though I never wrote about some of the darker things on my blog, working there really sucked out my soul. It wasn’t about the kids or their families. It was about test scores. If you couldn’t get test scores, you weren’t “working hard enough.” If a student with a severe disability wanted to take the state test, he wasn’t allowed to for fear that the test scores would be lowered. I was so disgusted I had to quit. Gary, I truly admire you for sticking with what you know is right! For people who want to make a high-quality comparison, I suggest comparing those students who succeed in the charter school’s lottery with those who didn’t. This tends to yield real apples-to-apples comparisons, and removes the effects of self-selection. I saw an article in San Diego magazine on the Preuss School, an apparently miraculous school, which showed that self-selection entirely accounted for the academic benefits the school appeared to be conferring. Thanks for correcting the data error. Thanks for your post! I found you today after a cross-post from Diane Ravich. I loved your post, and by chance, I have also read your book “Reluctant Disciplinarian” which I LOVED! I read it after my first year of teaching and I thought “Yup. I did all that. oops!” 🙂 Your book really helped me look at things differently, and now, 6 years later, I am a parent of a 2 year old and I STILL think of what I learned in your book!